But I found an article which introduces rather more unique and “open to all” kind of fashion shows! 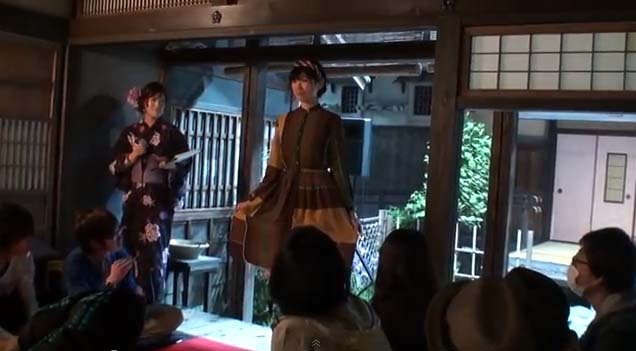 This is a fashion show held in an old traditional Japanese house. This show, Nadeshiko – retro-inspired fashion show- was held in a traditional house in Kochi pref under a theme of fashions in the end of Edo period in connection to the local hero of Kochi, Ryoma Sakamoto. And a show held right on a subway track in Tokyo! According to the article, this shows on subway track needed a bit of transformation after the show as the subway track was, of course, in use, so the atmosphere all got so tensed after the show as all station stuff and security officers turned up with very serious faces. Well, they simply couldn’t mess up the first trains schedule of the day by not being able to get rid of every fashion show things from the subway track! Hmn…nervous time(><) But it worth it? Other unique fashion show venues include main hall of a temple, in the middle of rice field, and some cultural heritage building, too! I think all these non-usual fashion show venues somehow stop people from feeling nervous and wondering if they are no super fashion conscious enough to be an audience of the event. Well, it could be just me a bit being paranoid here, but I do like shows in those unique places myself! If you have gone to a fashion show before, please let me know about your experience.